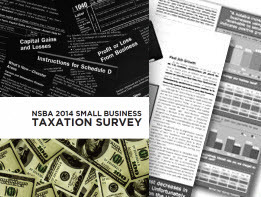 NSBA today released the 2014 Small Business Taxation Survey which provides detailed insight on how America’s small-business community is being impacted by federal taxes. Complexity and inconsistency within the tax code continue to plague small businesses with nearly one-in-three spending more than $10,000 per year on the administration alone of federal taxes. Underscoring the complexity of the federal tax code is the fact that 86 percent of small-business owners must pay an external tax practitioner or accountant to handle their taxes. Small firms ranked income taxes (the majority, 83 percent, are pass-through entities and therefore pay taxes on their business income at the individual level) and payroll taxes as the top two most burdensome taxes both financially and administratively. The survey is being released in conjunction with a hearing of the House Committee on Small Business examining the crushing tax burden facing America’s small businesses, at which NSBA First Vice Chair Tim Reynolds will testify. In his comments, Reynolds will highlight the vast complexity outlined in the NSBA survey as well as the real-world implications of layers-upon-layers of tax rules on his firm.